Cetti is firmly ensconced as Fog Willow’s keeper and handles the negotiations and meetings revolving around the storm glass while Fitzroy leads the battle against the invaders. While the family depends upon her invention and acumen to keep the business afloat, Steven Fitzroy despises her. His sister, Phinia, resents her also. Whether this is jealousy due to Cettie’s warm relationship with their father or her origin steeped in the poverty of Fells, it is a discontent that colors much of their interactions. Even as Cettie faces challenges with the Fitzroy’s, her attention is divided by their new neighbors, Rand Patchett, and his sister, Joanna, and her visions of the future. Sera, having being isolated by Lady Corrine at Penhaven Sky for three years, is eager to regain her freedom. Behind her compliant and obedient façade, she plots to further her plan to help the poor and reign with justice and parity. Opportunity finds her headed toward Kingfountain with a diminutive ally and a possible alliance that will strengthen her bid for her throne. 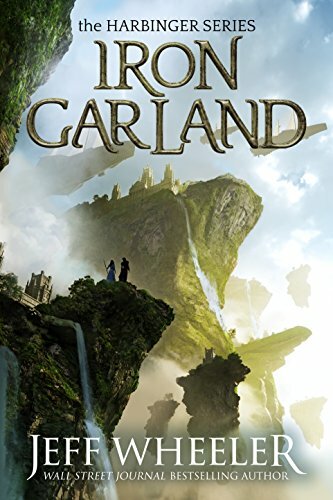 Wheeler polishes his craft with every book and Iron Garland is a twisty maze of a read, full of plots within plots, murderous mysteries, and feisty females unwilling to accept their assigned lot in life. Lots of strong characters, most of them female at the moment, believable characters with unique voices, and immersive world-building. Just another wonderful read. Highly recommended for those who love fantasy, alternate historical fantasies, mysteries, and complex storytelling. The only downside to this book is that I have to wait for the next one. Off to read Kingfountain…. I received this book as a digital Advanced Reader Copy (ARC) from the publisher through NetGalley. My opinions are my own.